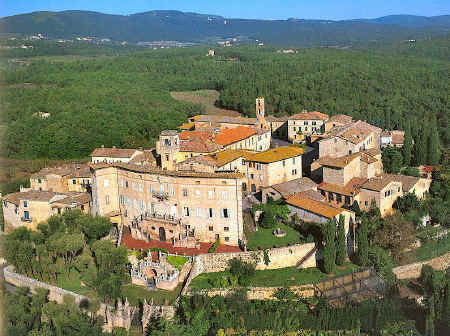 Sovicille is located about 10 km west of Sienna on the old via Maremmana, the road running from Sienna to the coast of the Maremma. This area has been inhabited since the neolithic times and archaeologists have found remains of prehistoric, Etruscan and Roman settlements. 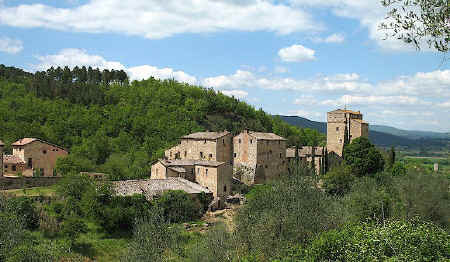 Sovicille and its surrounding area are rich in abbeys and Romanesque parish churches such as those of San Giusto a Balli, Pernina, Molli, Ponte allo Spino, San Lorenzo a Sovicille and Torri. There are also some remarkable villas such as Villa Cetinale (17 C, designed by Carlo Fontana), Villa Celsa with its beautiful gardens and Villa Linari (18 C). 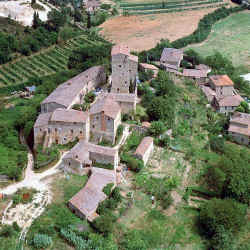 Stigliano is a small castle and village located near Sovicille. Excavations of some of the ancient walls suggest that they were constructed by the Etruscans, perhaps as a defense against the invasion of the Gallic Senones. Local toponyms such as the name of the village Brenna, close to Stigliano, could stem from the name of Gallic chieftain, Brennus, who led an attack on Rome in 387 BC. The name of the Merse river, which flows about 3 km from Stigliano, might have a similar derivation to the name of Merseburg, a town in eastern Germany, coming from Old Saxon meri and Old German mari, alluding to a watery place. During the Etruscan period, the River Merse and its valley formed a natural passage leading directly into the heart of the metal mining area. Although very little is know of Stigliano during the Roman times, the name of Sextilianum, which appears in later records, has been proposed to show existence of the town at the time. Stigliano is mentioned briefly during the early Middle Ages in documentation noting it as one of the many castles forming part of the Ardenghesca confederation. By the 14 C, Stigliano was probably the hub of the network of roads crossing the region, one to Massa Marittima and another following the Rosia river to the Maremma. All routes passed through the villages of Torri and Stigliano, and traces of the old roads can be seen in the woods nearby Stigliano. 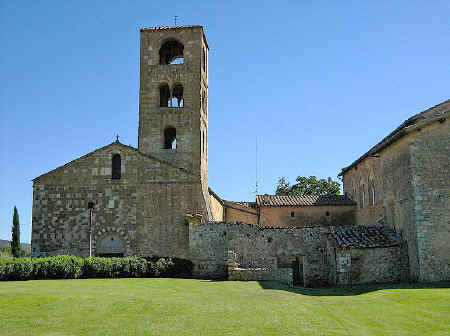 The establishment of a monastery at Torri evoked economical growth and development of the area. The monks carried out an agricultural and industrial revolution, draining the marshes and introducing water mills along the Merse. During this period, Stigliano was an independent municipality that owned large areas of woodland and allocated land to its inhabitants, not only to farmers but also to commercial entrepreneurs and merchants. There are documents recording land exchanges with the Siennese as far back at the 13 C. However, after the outbreak of the Black Death in 1348 and the subsequent decline of the population, these achievements were lost and even the revival of agriculture in the 18 C did not restore the thriving centre of mediaeval times.